It’s a good cause, and a nice community event. My husband and I were initially drawn to the CROP Walk – in which our own congregation participates – because it seemed accessible for young families. We want to involve our children in activities that support the less fortunate in our community and throughout the world, but many service opportunities seem impossible with multiple young children; we’d end up spending more time trying to control our offspring than doing anything helpful. But a 2.5-mile walk through the glorious gold, orange and red of a Middlebury October? That we could do! At least, that’s what we thought when we embarked upon our first CROP Walk, five years ago. CROP Walk 2011: It is a glorious gold, orange, and red Middlebury October. We have three children, aged three and under, so we bring two strollers: the double, and the single. All three children sit in the strollers, uncomplaining, for the majority of the walk. Occasionally, our oldest daughter wants to walk for a bit, which we consider endearingly tough of her. When we cross the finish line, we feel awfully pleased with ourselves. A new family tradition has begun! CROP Walk 2012: I am seven weeks pregnant with our fourth child, so I remember little about this CROP Walk other than that particular first trimester nausea tinged with excitement over my wonderful secret. My husband stays home with our youngest daughter so that she can nap, and I am alone with our 3-year-old and 4-year-old. We take the double stroller. Both girls are a little less uncomplaining than last year. I remember being grateful for child-wrangling assistance from various friends. CROP Walk 2013: I have a 3-month-old baby. I exist in a haze of sleep deprivation. I remember that we intended to do the CROP Walk. 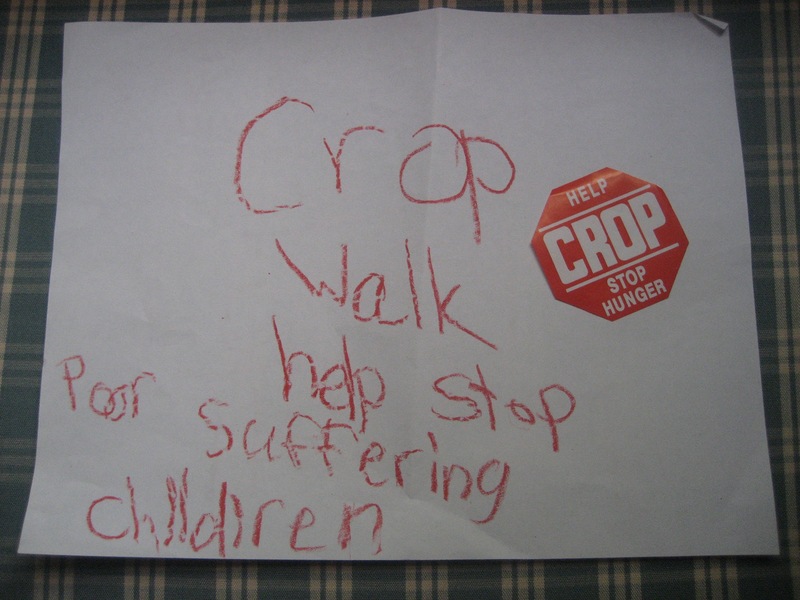 I remember that we raised funds for the CROP Walk. Beyond that, I remember nothing. I think it may have rained, and that we skipped the actual walk, but it’s all a blank. CROP Walk 2014: Thanks to my parents, who have recently moved to Middlebury, we have a ratio of one adult per child at the CROP Walk. And we need it, because our children are a mess: they want to walk, then they don’t, they want to be in the stroller, then they don’t, they want to be carried. What finally sinks us is the 10-minute bathroom stop at the Middlebury College library. The event organizers are dismantling the finish line as we approach, but hold it up so that we can all limp across. The CROP Walk is not a race, but if it were then we would have come in dead last. CROP Walk 2015! Our fifth CROP Walk (if we’re counting CROP Walk 2013, which may or may not have happened.) This year, we come prepared: This year, we bring the scooters. Our 7-, 6-, and 4-year-olds are proficient scooter-ers. They never seem to tire of zipping around our neighborhood on these two-wheeled metal contraptions; the key words there are: never seem to tire. We figure that if we bring scooters for our three oldest daughters, and the double stroller to hold our 2-year-old and the assorted jackets and water bottles that we’ve learned to pack to head off the inevitable complaints of thirst and cold, we’re all set. Our daughters are cautiously enthusiastic about their fifth (or fourth, if we exclude 2013) CROP Walk. They inquire about the concept of collecting pledge money for walking, they inquire about the distance of the walk, and they inquire whether we’ll come in last again. Then they arrive at the Middlebury town green and see the boxes of pizza donated by Green Peppers, and the doughnut holes donated by Middlebury Bagel & Deli, and they stop asking questions. Immediately after the walk begins, we realize that we’ve been too sure of the scooters. The first yards of the walk involve ascending a grassy slope; scooters are not best on grass or uphill. Our daughters are already demoralized, and multiple people are enlisted to carry their scooters uphill – scooters that tend to swing around and bite you in the ankle when carried. We do not come in last place. The girls get certificates of participation. My husband and I wonder whether we’ll really attempt the CROP Walk again next year. But of course we will; after all, it’s a family tradition.